For many of our teams, the 'unit of data' in qualitative user research is the sticky note - or, more precisely, units of information captured onto sticky notes. People often think this is amusing, given we’re always talking about digital by default. As a result of making and analysing so many sticky notes, we’ve become a bit opinionated about what a ‘good’ user research data sticky note looks like. There are good, bad and downright useless ways of recording data onto sticky notes. Capture verbatim quotes or direct observations. Don’t make analysis notes on the sticky note. Capture exactly what you’ve seen or heard the participant say. Let the sticky note become the voice of the user. One data point per sticky note. No bullet points. During analysis, you need to be able to independently move quotes and observations around, so don’t group them on one note. Code sticky notes with a participant ID. Mark each sticky note with a code that will help you identify which participant said or did the thing you noted. An easy way to do this is to number participants in the order you see them. 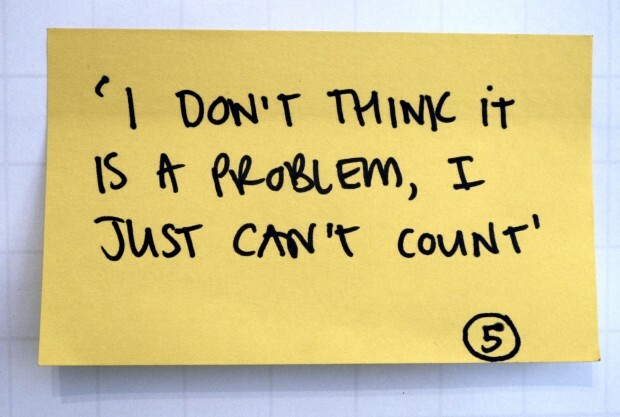 Our sticky note example shows a number 5 - this note refers to the 5th participant in the study. Use colour thoughtfully. Colour coding can be very useful when you’re doing analysis, so think about how to use it meaningfully. We capture all observations on one colour sticky note, then use a different colour to indicate findings and another colour for actions. Some people like to use different colour sticky notes to indicate things that went well and things that were problematic. Other people use colour to indicate different types of participants, for example, ‘confident online’ and ‘not confident online’. Thick pens. Match the thickness of your pen to the size of your sticky note. Never use a biro. We usually use 3x5 inch sticky notes and a pen with 0.5mm width. Encourage observers to write in capital letters. Although it’s slower, it makes everyone’s handwriting more legible, which is important when you’re doing analysis. Decent quality sticky notes. There’s nothing more annoying than having your sticky notes rain from the walls while you're trying to do analysis. When it comes to sticky notes, the glue really matters and you get what you pay for. Follow these guidelines, and you’ll be set for a great research analysis session. Do you have any sticky note tips? We'd love to hear from you - share them in comments. Remember to pull the sticky notes off the block the right way. If you peel them upwards, the sticky strip bends along its length and the note will fall off the wall much sooner. Pull from the side, or better still straight down from the bottom, and you'll end up with a much longer-lived note. One thing I would add in terms of content is to not think too hard about what you put on the sticky note - just get it up there! It's similar to the idea of leaving the analysis for later in the sense that you're simply trying to get the data that resonates most with you up on the wall rather than making judgements about it straight away. I leave key words on the sticky. Even if it's a swear word. A rant, copied verbatim is very motivating for the project team. @James; I'm plagued by low quality / suicidal sticky notes. Little did I realise that my peel technique was compounding the situation - thanks!